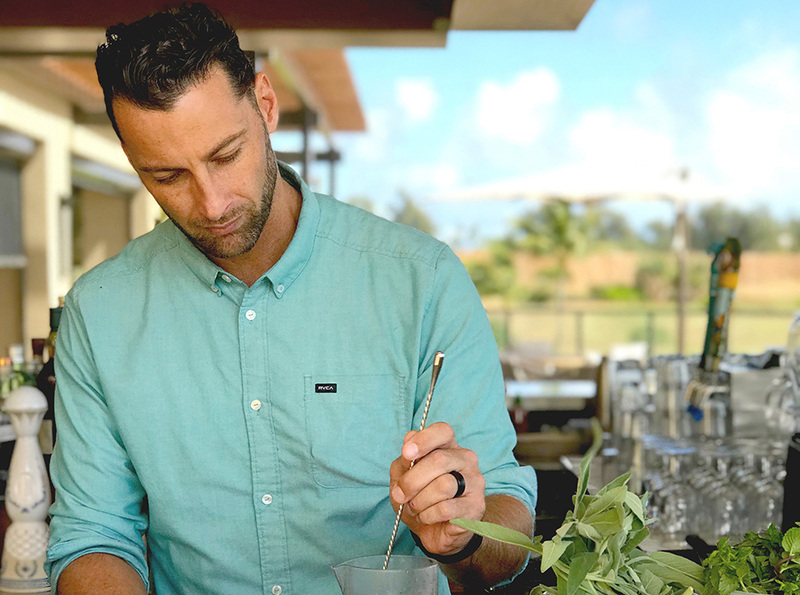 If you think mixing drinks is as simple as a little shake-and-stir, you probably haven’t met Ian Value, mixologist at Hualani’s restaurant at Timbers Kauai. Creating specialty cocktails is, well, his specialty. His arsenal of techniques rival that of any professional chef and there’s no kitchen tool he won’t employ to create the perfect sip. In addition to using only the freshest ingredients, many of which can only be found on the island of Kauai and some that are exclusive to the on-site organic Farm at Hokuala, he’s busting out kitchen gadgets from the smoker to the sous vide (a machine chefs use to cook to precise temperature) and making almost every component (think: bitters and herb infused ice cubes) from scratch. Did we mention he’s really into molecular gastronomy? We caught up with the mad scientist of cocktails to talk about his extraordinary drink menu offering, not to mention a few Hawaiian ingredients that might be a little tricky to pronounce. Tell me a little bit about your background and how you got into bartending. I’m from Maui originally. My family has been in Hawaii for as long as I can remember. My parents met in Kauai; they have a long history here. I started bartending at the Westin 10 years ago, playing around and breaking things down and trying to recreate them and make them better. Instead of mixing drinks and just going through the motions of using someone else’s recipes, I decided to create my own. That’s something I enjoy doing. The creative process keeps my job fresh and amazing. I was super excited to come to Timbers because of all the freedom I have to try new things and the amazing ingredients we have here on our farm. What is the difference between bartending and mixology? To me it’s being interested in finding that perfect balanced cocktail, creating new things, experimenting, breaking things down and putting them back together in new ways. It’s like a science experiment. Every day I’m trying new things with new components and new techniques using the freshest ingredients. It’s similar to what a chef would do. Let’s talk about some of the special ingredients you have to work with that are special to Kauai or even to Hualani’s that you might not be able to get anywhere else. We get these amazing ingredients straight from the on-site farm almost every day. It’s like no other place I’ve ever worked. Farmer Cody has all these esoteric ingredients. Like the finger limes—they’re the caviar of limes, they taste amazing. The other day the chefs brought in these Buddha’s Hands, this cool citrus I’d never worked with before and it was amazing as well. Being in Hawaii we get all the different citrus, not only from the farm but all around the island. I talked to Cody about putting together a tea garden to infuse the tea in the cocktails. I want to use a dry ice and then pour the tea on top of it at the table. Whoever heard of a table pour for a cocktail? Tell us about some of the other unusual techniques you’re using. I’ve been infusing all kinds of things using the sous vide. We’ll take rum and use pineapple and let it sit and cook into the rum and pour that into the cocktail. I also love to use the smoker. I did a smoked pineapple Old Fashion using the rum infused pineapple I’d made in the sous vide and Koloa Rum, which is made right here in Kauai. A couple weeks ago we did an apple wood smoked Old Fashion using Kiawe wood that comes from here on island and green chartreuse ice cubes, so as the cocktail melted, it got this herbal quality to it. I’m also really into molecular gastronomy and want to start experimenting more with foams. We did a crushed iced mojito coconut with Matcha coconut foam recently that worked really well. 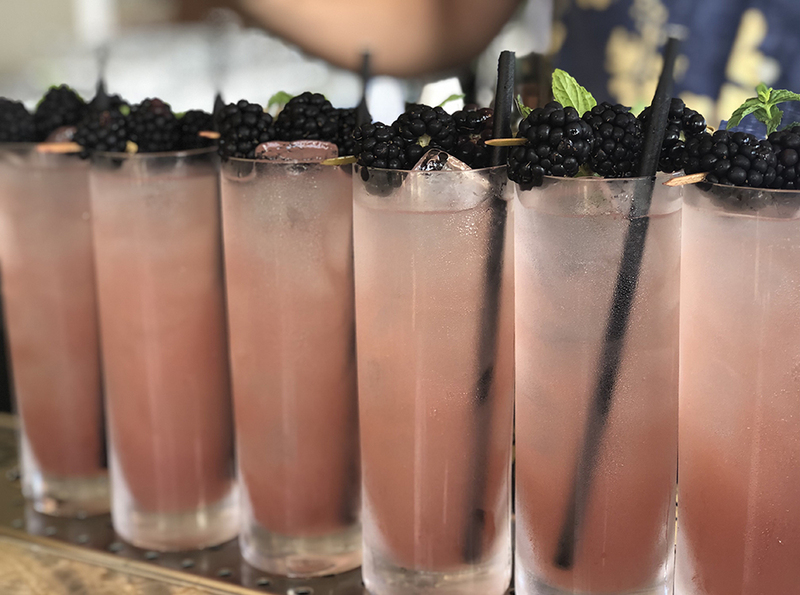 What is your inspiration or starting point when creating a specialty cocktail? I start with the natural ingredients we grow right here and think about what’s unique to Hawaii. I grew up here and want to be true to who I am, so that’s a great place to start. For dining reservations at Hualani’s Restaurant, please contact 808.320.7400 or OpenTable.